I have never had such a sense of—the only word I can think of is— the "beingness" of a place before. “Beingness” may not be a word we commonly use in historic preservation; it may not even be a word at all. 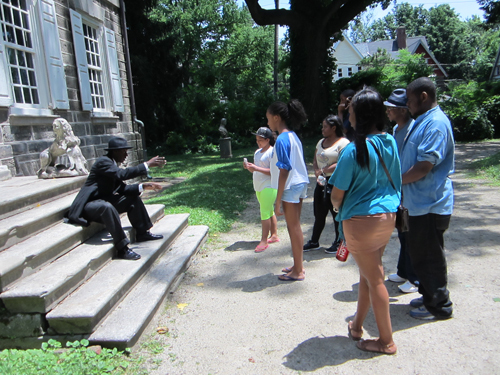 The above quotation came from a visitor attending a new program at Cliveden, a National Trust historic site located in the Germantown section of Philadelphia.The program, “Liberty to Go to See,” gave life to this National Historic Landmark in ways that surprised all its participants. The “beingness” of a place may well be a concept worth considering as we re-imagine historic sites. 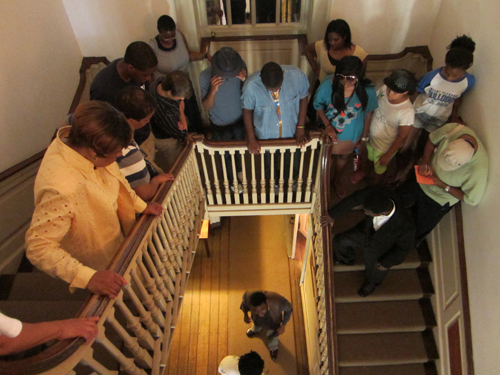 Over Juneteenth weekend this summer, Cliveden debuted four public performances of “Liberty to Go to See.” This dramatic event took place in the 1767 mansion and featured professional actors working from a script written by teenagers based on original documents and actual events in the history of Cliveden. The audience, limited to 20 people per performance, followed the actors through the Main House in careful procession from scene to scene. The performances offered Cliveden a bold new history reenactment to go along with its annual re-creation of the 1777 Revolutionary War Battle of Germantown. Cliveden, built by the wealthy Chew family, has been known for its Georgian architecture and role in the Revolution. 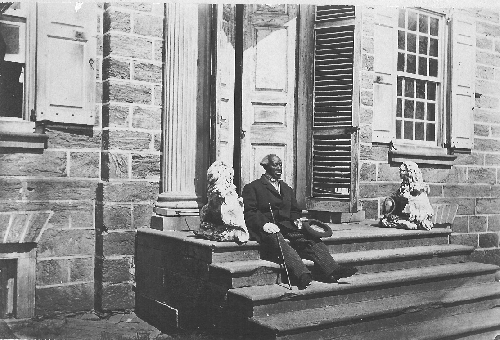 Recently the site expanded its interpretation as a shrine to colonial history; it is now using Chew family documents and the family’s history of slave-owning to turn Cliveden into a forum for considering the how the past shapes all our lives. “Liberty to Go to See” is one of many new initiatives of the transformed Cliveden. 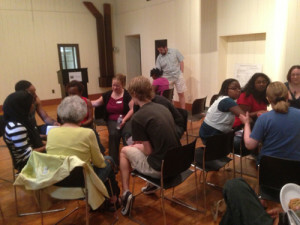 Outside organizations can rent space at Cliveden’s Carriage House, which serves as the community center at the site. Among the groups who rented Cliveden was the staff of Philadelphia Young Playwrights. Their encounter with the site led to Cliveden commissioning the Philadelphia Young Playwrights to draft a script based on the Chew Papers, to be performed in the Main House of Cliveden. 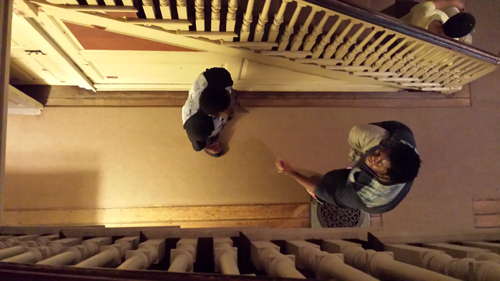 Over the course of ten months, 14 teenaged playwrights from all over Philadelphia came to know Cliveden and the history of the family. The teens helped open Cliveden for tours, gave their own tours, debated details with historians, examined documents with archivists, and experienced the site on their own terms. 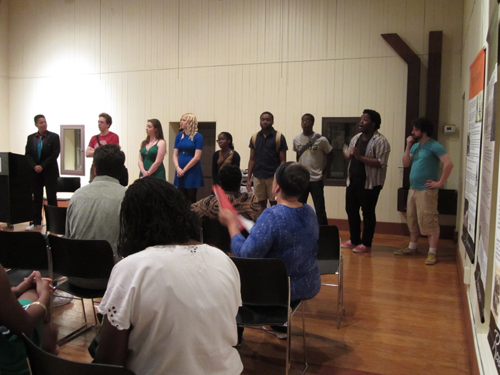 Using a draft script, professional actors previewed scenes for community members and Chew descendents who offered valuable feedback directly to the playwrights. The New Freedom Theater, Philadelphia’s oldest African American theater company, saw the previews and agreed to produce and perform the event. A grant from the Interpretation and Education Fund of the National Trust for Historic Preservation, allowed creative professionals to work with Cliveden staff to revise the script, develop pre-performance activities, and cast and costume the production with local actors. For the Cliveden staff, the challenge of having actors running through the Main House was outweighed by the energy of new creative approaches. Scenes took place in bedrooms, on the servants’ staircase, and even on the rear porch. The result created a sense of 360-degree immersion with no escape from the themes of the script—audiences eavesdropped on people in ten scenes that involved intimate encounters with what “liberty” meant in specific circumstances from the 1770s to the 1870s. For the actors, a new crowd at each performance meant that people were standing in different parts of the room, so everyone had to be alert. The actors appreciated the issues from the past which still remain relevant today. For instance, women faced divorce and threats of violence, which raised the stakes based on legal or social confines of the time. That young people could write such powerful scenes about women’s rights, enslavement and indentured servitude was amazing. Not every historic site was the location of a major battle or involved complex relations of a large family connected to enslavement, Underground Railroad activity, or plantation violence. The large national themes offered in the history of Cliveden may not apply elsewhere, but many aspects of “Liberty to Go to See” are transferable. This program could be replicated at other sites as long as the playwrights ground their work in actual documents and situations of people. Interestingly, “beinginess” does not depend on detailed accuracy. Close readings of actual documents did not mean that all of the dialogue was historic. Telling real stories of real people and what happened to them did not require overloading on dates or a list of begats. Audience evaluations revealed, however, that people learned key details of the past that surprised them, such as that some overseers were free Blacks. Similar possibilities for discovery may lie with any site that tells of the choices people faced. Issues might include tragedy, financial tensions, or family divisions during national conflicts or changed circumstances—many human choices can be considered for dramatic effect. 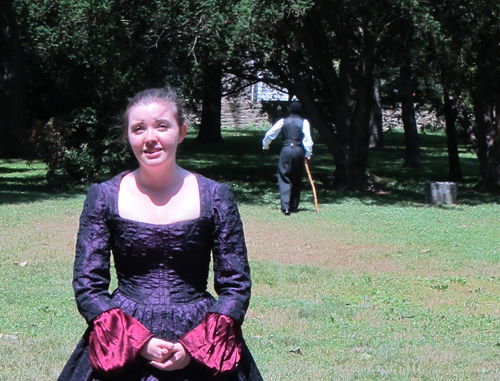 Across the country historic sites often see promising results using plays and performances to build audiences. “Murder mysteries” or performances of “A Christmas Carol” bring a historic house alive and attract visitors who might not normally visit. Cliveden’s experience with “Liberty to Go to See” suggests, however, that a powerful experience can be gained from delving into existing sources at a site and looking at them with the fresh eyes of other partners. Cliveden’s “Liberty to Go to See” shows that, by rooting different perspectives in how people faced hard choices along with engagement with authentic architecture from new viewpoints, any site can give life to history and offer people a sense of beingness. David W. Young is the executive director of Cliveden. He has a Ph.D. in history from Ohio State University and serves as a lecturer in the Graduate Program in Historic Preservation at the University of Pennsylvania School of Design. Editor's Note: This post is a web companion to the summer 2014 issue of Forum Journal: Stepping into the Future at Historic Sites.